First up, character customization. 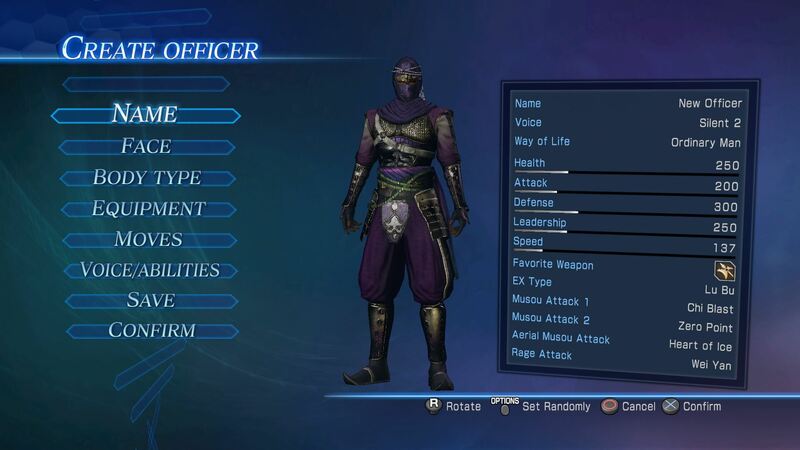 Instead of tweaking a pre-existing character to your exact specifications, DW8:E gives you and your co-op partner the tools you need to craft your own mass-murdering general. Tired of controlling handsome, svelt representations of legendary Chinese warriors? Me too! 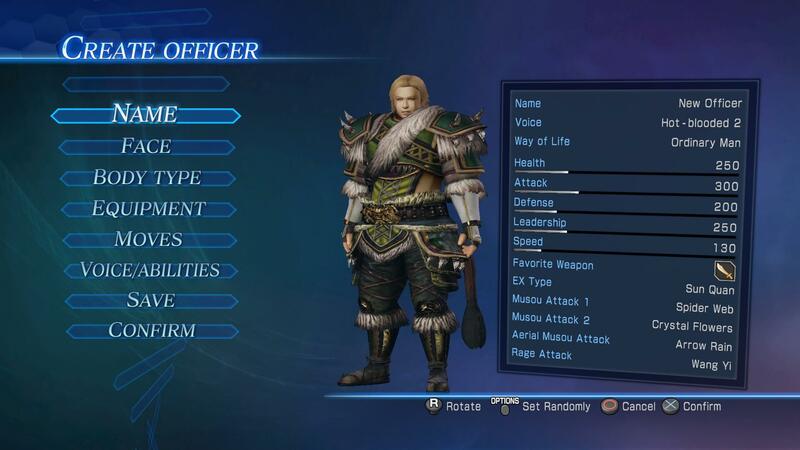 Hew a guy (or, if you prefer, a gal) from nothing, then slap on a couple hundred pounds of pure rage for the opportunity to conquer the Middle Kingdom as a Plus Sized commander. Or you could just give your character an emo haircut and a poofy sweater and call it a day. You could of course make a cool, imposing hero to rampage through classical China, but then you'd be missing out on watching your pallid general inspire a nation while decked out in a mink coat and cut offs. Conquering an enormous swath of land requires some new tech on the field as well. Introducing two weapon debuts in the Dynasty Warriors series: the Revolving Crossbow and the Formation Rod. The Revolving Crossbow gives you chaingun power at a low-tech price. And you can even smack fellas around with it if "rifle whipping" is your thing. While the Revolving Crossbow could, theoretically, be a thing we human beings might craft for war, the Formation rod relies on the power of sorcery to smite your foes. I really doubt this one is historically accurate. With your new tools and terrible, terrible haircut, you're finally ready to bring China under your iron grasp once more. Dynasty Warriors 8: Empires is due out the 27th for Xbox One, Playstation 3, and Playstation 4.